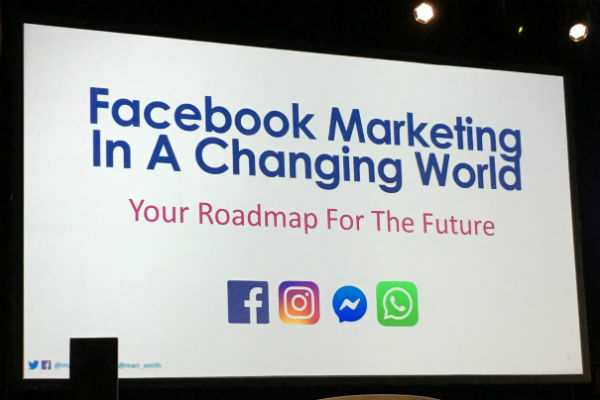 SMMW Recap: Mari Smith Talks Adapting to Facebook’s Changes | Reshift Media Inc.
Mari Smith’s much-anticipated presentation at Social Media Marketing World 2019 (SMMW19) was all about adapting your Facebook marketing to changing consumer behavior and it was full of great insight and tips. She is so knowledgeable about Facebook that I always look forward to hearing her speak. Smith is very keyed into what Facebook is doing these days and where they’re going in the future. Mari started by asking the crowd, “Who has a love/hate relationship with Facebook?” which led to lots of cheers. She talked about how organic reach has fallen over the years and now hovers somewhere around 1–6%. Watch parties (this has nothing to do with the Watch platform) is another way to increase organic reach and should be part of your marketing mix this year. They can exponentially increase your organic reach. 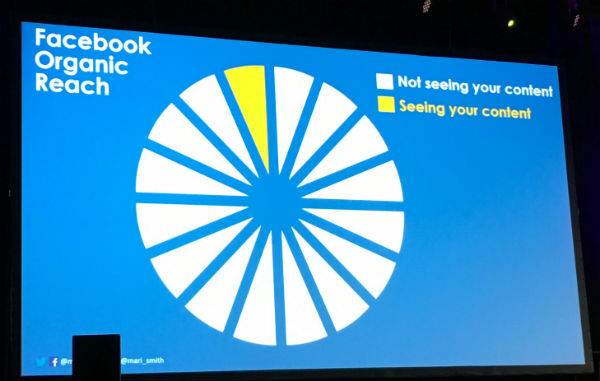 There are some big changes coming to Facebook. According to Smith, Mark Zuckerberg has a goal to create a privacy-focused social foundation for the future. And of course, there will be less monumental changes such as Coin being worked into WhatsApp for payments. In terms of their competition, Smith says China’s WeChat is one to watch. Facebook will never be WeChat as an all-in-one app, but they’ll do their best with the Facebook family of apps and services (Facebook, Instagram, WhatsApp and Messenger). The other app we need to pay attention to is TikTok. It’s a short-form video app out of China and is one of the fastest growing apps in the US. It’s used by a younger demo but has also been made popular with the more mature demo thanks to Jimmy Fallon. As for acquisitions, we know that Facebook acquired Instagram and WhatsApp, and tried to acquire Snapchat a number of times. They probably won’t be able to buy TikTok, but they quietly launched Lasso, which is a TikTok copycat. Facebook is determined to be a next generation digital streaming television platform. Yes, the Watch platform they’ve been pushing for a while is doing ok, but it’s not doing as well as they had hoped. Some of the teams are being deployed onto other projects. Red Talk Table, hosted by Jada Pinkett Smith, is definitely their runaway success. A recent show set a record with 31 million multiple minute views. They’ll be able to monetize these types of shows with ads. Facebook has a global mission to “Bring the World Closer Together”, but did you know they also have a mission statement just for video? It’s “To create shared experiences and a sense of belonging through video”. Smith said the most engaging content is short-form video. Anything under 3-minutes is short-form. (She cited Hubspot’s Facebook page as a good example). You also want to optimize for mobile consumption using vertical or square video, designed for sound off, and always include a text overlay. Smith said she is currently running a challenge group for her clients, asking everyone to make a video a day. 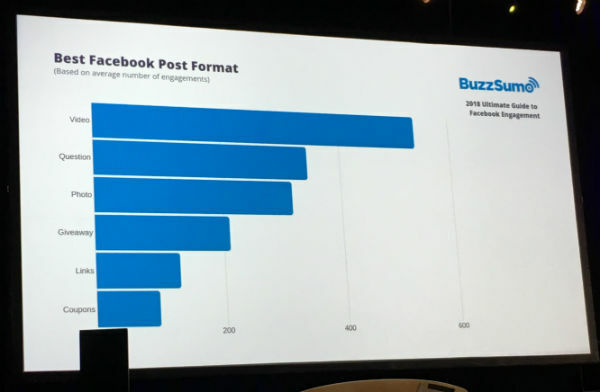 Facebook’s algorithm will actually give you better reach if you post content every day for 30-days straight. Smith recommended less link posts and more video posts. You can still put links in your videos and include a call-to-action button. She recommends 70% of your content should be video, 20% images and 10% links. You could think of Stories as part of video, but Stories are also images, text, stickers, polls; it’s micro-content. Instagram is Facebook’s next Facebook. Zuckerberg says stories are the future and are growing 15x faster than news feed content. As advertisers, we need to take advantage of running ads here now, as the cost is still low as there’s more inventory than there are ads. It’s not just Messenger and WhatsApp. Are you using Instagram Direct? They’ll be integrating all 3 of these apps, not to be one but to make them what is called interoperable. So if you’re on Messenger, you can communicate with someone on WhatsApp. Marketplace is the example that Zuckerberg gave. If you want to buy something on Marketplace and you’re on Messenger, you can tap a button and someone else can get it on WhatsApp. Smith also cited chatbots as a rising trend, saying 40% of people said that they don’t care if customer service comes from a human or technology, as long as it’s the right answer. I loved the stat she cited from Gartner: by 2020, 85% of our engagement with businesses will be done without interacting with another human; instead we’ll be using self-serve options and chatbots. Having meaningful social interactions in niche communities is another rising tread. There has been speculation for some time that ads are coming to Facebook groups so you’ll be able to promote your group. Smith said she saw them testing a “boost” button. Zuckerberg said that the fastest growing areas are private messaging, Stories and small groups. Facebook’s privacy-focused platforms will grow faster. Smith summed up her presentation by saying it all starts with your core audience and community. It’s not about vanity metrics or getting millions of fans, even reach is sometimes a vanity metric. It’s about getting real, measurable business results and ROI. 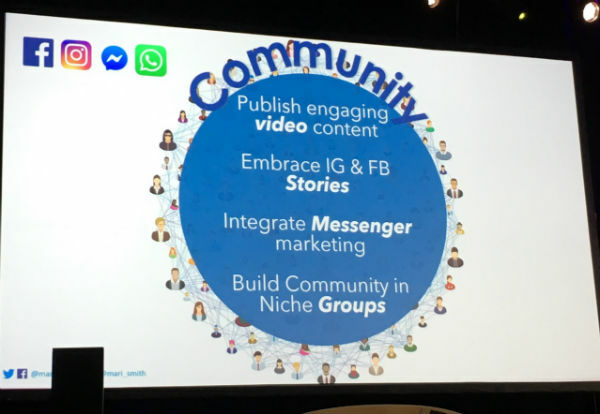 Start with your core audience and regularly publish video content, embrace Facebook and Instagram stories (whether organic or sponsored) and integrate messenger marketing on both Messenger and WhatsApp. According to Smith, your focus should be building communities in niche groups and creating deep, powerful communities.